Since the clergy abuse scandal broke in January 2002, three priests have been exonerated by the archdiocese after being suspended from duty over allegations of sexual abuse. 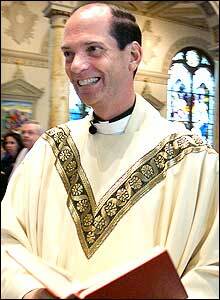 The archdiocese suspended the Rev. 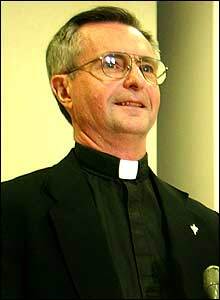 Ronald L. Bourgault from his post at Saint Zepherin Church in Wayland on June 26, 2002, after receiving what was deemed to be a credible abuse allegation against him. Eight months later, Bourgault was reinstated after his accuser admitted that he had misidentified the priest. The case marks the first time an alleged victim has admitted to a mistaken identification in a complaint involving an Archdiocese of Boston priest. The Boston Archdiocese announced the reinstatement yesterday of a Wayland priest who was suspended in June on an accusation that he had sexually abused a minor more than 30 years ago. But the alleged victim's lawyer criticized the move, saying the church had not adequately investigated her client's allegation. An alleged victim of clergy sexual abuse acknowledged yesterday that he misidentified a Wayland priest as his abuser, an error that resulted in Rev. Ronald L. Bourgault being placed on administrative leave in June. A day after learning that the man who had accused him of molestation had admitted he had the wrong man, the Rev. Ronald L. Bourgault basked in a joyous welcome back to St. Zepherin Church in Wayland, which he had been forced to leave after the Archdiocese of Boston received the allegation against him last June. Paul R. Edwards, 35, files a lawsuit in Suffolk Superior Court accusing Foster and the late Rev. William J. Cummings of molesting him while Edwards was at two Newton parishes in the early 1980s. Edwards goes public with his charges in a televised statement. His lawyer, Eric J. Parker, admits that key dates given by Edwards are incorrect, but he declines to permit Edwards to be interviewed. A Globe report raises doubts about the charges against Foster, noting that Edwards has a history of inventing stories and that friends of both priests and Edwards have offered statements that contradict Edwards�s assertion that he was molested. Parker says he has started an enormous effort to look at the truthfulness of his client�s charges. More evidence emerges to challenge Edwards�s account, and his credibility on other issues. Parker, sending a signal that he has doubts about the charges, asks the court�s permission to withdraw as Edwards�s attorney. Judge Constance M. Sweeney, saying she has significant concerns about the credibility of the accusations, orders Edwards to appear in her courtroom on September 4. Edwards withdraws his lawsuit with prejudice, meaning he cannot file it again, prompting legal observers to assert that the charges were probably false. Suffolk prosecutors announce a criminal inquiry into whether Edwards had indeed filed false charges. Foster expresses relief, but calls the church procedures for investigating complaints defective. Cardinal Bernard F. Law tells Foster he has been cleared and reinstated, and asks Foster to celebrate Mass with him the following Sunday. The Globe reports Foster�s exoneration. The same day, Edwards meets for the first time with church investigators, and insists that his charges are true. Late in the day, Foster issues a statement expressing joy at his reinstatement. But within an hour, he is asked to meet with church officials to discuss the renewed charges by Edwards. After a tense late-night meeting, Foster is placed on leave again and the investigation reopened. Law calls Foster late in the evening to tell him that the second investigation has also concluded that the accusations were without substance. At 10 p.m., the archdiocese faxes a news release announcing his reinstatement. Edwards reiterates his allegations against Foster and asks the archdiocese to reopen its investigation. In August 2002, Monsignor Michael Smith Foster, the chief canon lawyer for the archdiocese, was accused of sexual abuse by a man whose credibility was quickly called into question. After a 76-day ordeal in which he was twice removed from duty, Foster was reinstated in October after his accuser was discredited. However, the alleged victim continues to press his claim and has asked the church to reopen the case. A Winchendon man alleged in a lawsuit filed this week that he was sexually molested as a Newton teenager by two priests during the same period, one a monsignor and canon lawyer. The Boston Priests Forum is demanding rights for priests accused of sexually abusing minors, as the organization's members express concerns that a priest might be falsely charged. Paul R. Edwards, who has accused two Boston-area priests of abusing him in the 1980s, has a long history of embellishment, according to many of his childhood friends. The lawyer for a former Newton resident who has accused two priests of molesting him in the 1980s said yesterday that he will seek to verify claims by his client that are now in doubt. Suffolk Superior Court Judge Constance M. Sweeney yesterday declared that she has "significant concerns" about the credibility of sexual abuse allegations against two priests. The archdiocese did not take even minimal steps to gauge the credibility of the allegations against Monsignor Michael Smith Foster, despite evidence that the abuse charges may be baseless. Amid growing doubts about the credibility of his charges, a Winchendon man yesterday withdrew a lawsuit accusing Monsignor Michael Smith Foster and another Boston priest of sexual abuse. The clergy sexual abuse scandal, because it was kept hidden from view for so long, was bound to produce false accusations once it exploded into public notice this year. Monsignor Michael Smith Foster expressed dismay with the Archdiocese of Boston yesterday for its public silence about his fate, three days after his accuser withdrew his sexual abuse lawsuit. The Archdiocese of Boston has formally exonerated Monsignor Michael Smith Foster of charges that he sexually molested a Newton teenager, according to people involved with the decision. In a stunning turnabout, the Archdiocese of Boston yesterday reversed its decision to return Monsignor Michael Smith Foster to duty, just days after investigators had exonerated him. In the more than five weeks since Monsignor Michael Smith Foster was accused of sexual abuse, more than a dozen people have said they have evidence that will disprove the accusation. Church officials plan to offer their first official response to priests who say they have been falsely accused of sexual misconduct and then languish in legal limbo, hearing little from the church. For a second time, the Archdiocese of Boston has reinstated Monsignor Michael Smith Foster to active ministry after a two-month ordeal during which he twice took a leave of absence. After weathering two church investigations, Monsignor Michael Smith Foster yesterday returned to his post at the Boston archdiocese with a host of unanswered questions about the fate of others. Catholic leaders and a Harvard scholar used yesterday's annual Red Mass and Catholic Lawyers Guild luncheon to welcome back a monsignor falsely accused of sexual misconduct. No one in authority, not Cardinal Bernard Law or any other bishop, has apologized to Monsignor Michael Smith Foster for the way he was treated during his ordeal as a priest falsely accused. Monsignor Michael Smith Foster's walk up the center aisle of Newton's Sacred Heart Parish - a return to his favorite parish after being cleared of sexual abuse allegations - looked like a victory lap. Months after dropping a lawsuit against Monsignor Michael Smith Foster, Paul R. Edwards called on the Archdiocese of Boston to reopen its investigation into his allegations of sexual abuse. The Archdiocese of Boston knew about a second sexual abuse lawsuit against the late Rev. William J. Cummings two months before deciding last fall that there was no evidence to support another man's accusation that he was molested in the 1980s by both Cummings and Monsignor Michael Smith Foster. The Rev. Edward McDonagh was removed from St. Ann's in West Bridgewater in May 2002 after an abuse allegation was lodged against him. Parishioners were angered by the removal and began a loyal campaign in support of their priest. Some suspected that McDonagh's suspension was motivated by his outspoken criticism of Cardinal Bernard Law. 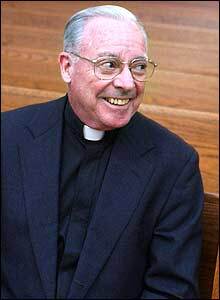 On Feb. 13, 2003, the archdiocese cleared McDonagh after officials were unable to substantiate the claim against him. He was warmly welcomed back by the joyous congregation at St. Ann's. The Archdiocese of Boston yesterday removed a West Bridgewater pastor from parish duty and placed him on administrative leave because of an allegation that he sexually abused a child in the past. Parishioners at St. Ann's Catholic Church reacted with outrage yesterday afternoon to the temporary removal of their pastor over allegations of sexual misconduct and claimed the priest was suspended for his outspoken criticism of Cardinal Bernard Law. For the past 10 Sunday nights, they have met in front of St. Ann's Church, holding candles in one hand and rosaries in the other, praying and waiting, waiting and praying. They say they will be there every Sunday evening, as long as it takes, until their priest returns home. It gets dark early now, and so the prayer vigil at St. Ann's Church in West Bridgewater starts an hour earlier. Parishioners wear yellow ribbons in their lapels and recite a host of Hail Marys and Our Fathers in honor of their departed priest. The Boston Archdiocese yesterday reinstated a West Bridgewater priest known as an outspoken critic of Cardinal Bernard F. Law after a nine-month investigation by church officials failed to substantiate an allegation that he had raped a boy nearly 40 years ago. At St. Ann's, it was as if the pope himself had come to visit. The church was standing room only, and as the pastor walked down the aisle to the organ strains of ''O Holy Night,'' the congregation took to its feet, applauding and whistling.